Today over at Sketchabilities is this project and above my interpretation of it. At Sandee and Amelies is Balloon, Balloon. I firstly got a piece of 12 x 12 white acid free cardstock and using my hero arts stamp ‘friends’ stamped in the background with walnut stain distress ink. I also used Tea Dye and memento ink in Expresso. 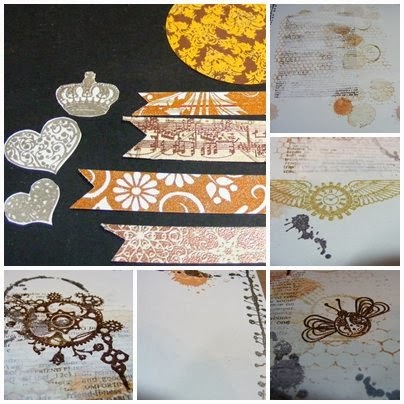 I then used my Stampers Annonymous Classics 6 stamp, Creative Expressions honeycomb stamp, Paper Artsy blob stamp, BO Bunny ink impression stamp, Kanban steampunk stamps and Inkadinkadoo steampunk stamps to create the background and the balloons. I then used a white wash of white gesso over the words. The right top corner tags are made from Kanban ticket stamps and an Inkylicious face stamp. The other tickets, background circle and flags are made from background papers stamped with the following WOW stamps – Vintage Wallpaper, Funky Border, Flowers, ME Blizzard, Brocade and French Music. The WOW embossing powders used are – copper, copper pearl, bark, gold rich, gold pearl, platinum, copper metallic, ebony black, clear gloss and nutmeg. All super fine. 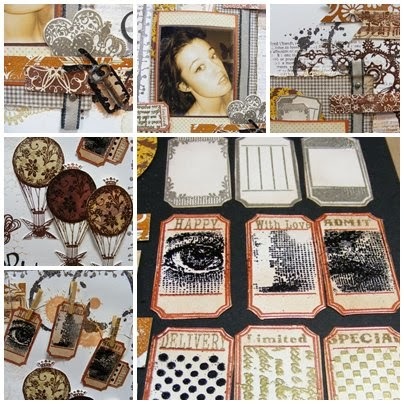 Embellishments are brads, rusty key, ribbon, wire and pegs. are Latin for Balloon cut from my ‘George and Basic Shapes’ Cricut cartridge and I have printed a photo of my daughter (in sepia) who is young and free to see the world from any angle. ← Back to the Fuchsia…. What a brilliant LO and steampunk make! Love all the gorgeous details and the colours! Thank you so much for sharing your wonderful artwork with us at OurCreativeCorner AND SanDee&amelie's SPC! Awesome take on the sketch! Thanks for playing along at sketchabilities! Beautiful layout! Love the hot air balloons and details! 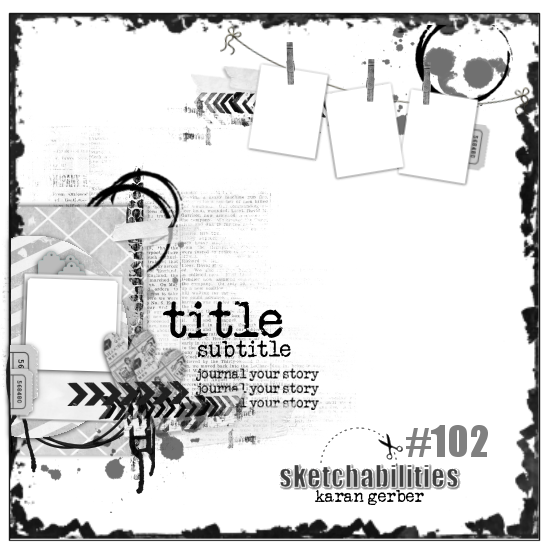 Thanks for playing along w/sketch #102 at sketchabilitiles! magnificent background, Sue! exquisite LO! totaly love your creation marvelous!